For many the name Arnold Ridley will probably mean nothing. However, mention The Ghost Train and quite a few will vaguely recognise his name. And if you reveal that he played bumbling, well meaning Private Godfrey in Dad's Army... well, almost everyone will know who you mean and form a picture in their head. This is a picture that haunts his son, the author of this audio book which is an abridged reading of the book of the same title, which itself was partly based on Arnold's "book" - the autobiography he never managed to have published in his life time. 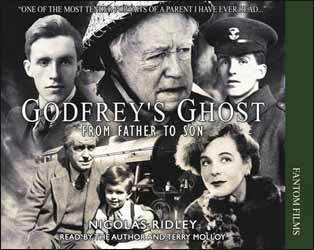 Godfrey's Ghost is, at its heart, the story of a father written by his son. Eager to get across that while Arnold was Private Godfrey on screen, the real Arnold was nothing like the bumbling man that many of us fondly remember. This, then, is an audio book designed to give people a more rounded view of the man - for Nicolas to set the record straight and let the world discover that the real Arnold was a great and gifted man, who only in his twilight years gave the gift of comedy to so many. The recording is based on Nicolas's recollections of events, as well as entries from his father's autobiography. Nicolas reads his own thoughts and the details fleshing out events, whilst Terry Molloy reads Arnold's own words and thoughts. This is an idea that works well and allows us to flip back and forth through stages of Arnold's life without it seeming forced or strange. If, like me, the main image in your head of Arnold is Private Godfrey, then you'll be well rewarded as you discover the real man who portrayed the gentle, mild-mannered resident of Cherry Tree Cottage.